As you know, we got a flock of new little chickens. 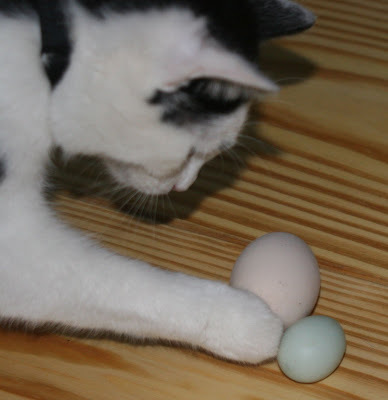 The first of the flock laid her first egg. As you can see, young chickens lay small eggs to start out before they get the hang of laying nice large eggs for our cooking pleasure. The small eggs are usually yolk-less. Trick decided to be the official egg sorter. That is interesting about the first egg. When we bought our house here there were a few chickens in a barn in the backyard. 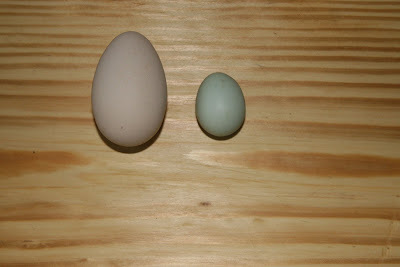 We bought some bantams chickens for our girls and they also had small eggs. What breed are your chickens?